A free market for labour? Not so. Google, Apple, and many other Silicon Valley companies entered into illegal “no poaching” deals, according to the Department of Justice, showing extreme measures technology giants take to keep top talent. The DoJ released evidence from its investigation into the hiring practices of top tech companies, demonstrating non-competitive hiring agreements existed. A former Lucasfilm software engineer sued the companies, alleging they had secret agreements not to recruit each other’s employees, pacts which violate antitrust laws, keep employee salaries and benefits down. The DoJ document includes an e-mail message from Adobe senior vice president of human resources, Theresa Townsley, confirming Adobe and Apple agreed not to hire each other’s staff. It also alludes to similar agreements between Lucasfilm and Pixar, as well as a Google-Intel no-poaching pact. Companies hand out bonuses and stock awards to keep top executives, such as the $380 million in stock. Apple recently gave its CEO, Tim Cook, but they in turn cap salaries of employees on the front lines and ensure nobody else can make a better offer, in effect tying them to the company through a lack of choice. Former Labour government foreign secretary, runner-up Labour leader, brother of Labour leader, David Milliband, has been channeling his income through a company in order to avoid tax. Milliband is earning up to £21,000 a day and channeling his earnings to a company jointly owned with his wife -- The Office Of David Miliband Limited -- effectively getting exemptions for half of his non-parliamentary earnings. The loophole allows tax reductions for joint enterprises if they take their income in the form of shared dividends, Miliband has managed to keep a great portion of his money to himself. Miliband recently pocketed £64,475 for a three-day advising role from the United Arab Emirates foreign ministry. He also works for Pakistan-based City firm Indus Basin Holdings. It was reported that he will do just five days’ work a year for the firm in return for a £50,000-a-year salary. The usual criticism of economists is that they missed the crisis, preferring their models to reality, and those models took no account of the mischief that could be caused by unregulated bankers running wild. Of all explanations, this is the most comforting; all academics need to do , presumably, is try a little harder next time. But economists didn't just fail to spot the financial crisis – they helped create it. They provided the intellectual framework and drew up the policies that helped caused the boom – and the bust. Yet rather than a full-blown investigation, their active involvement in this crisis and their motivations have barely got a look-in. As Philip Mirowski, one of the world's leading historians of economic thought, puts it: "The bankers have got off the hook, and gone back to business as usual – and so too have the economists." It's the same discipline that spoke all that nonsense about markets always being efficient that is now deciding how to reform the economy. Aditya Chakrabortty, columist of the Guardian writes ".. that the current economic system as a bankocracy run by the banks, for the banks. Mainstream economists play the role of a secularised priesthood, explaining to the laity just how and why the markets' will must be done...."
Think about the rewards for toeing the mainstream economic line. Publication in prestigious journals. Early professorships at top universities. The conferences, the consultancies at big banks, the speaking fees. And then: the solicitations of the press, the book contracts. Rob Johnson, director of the Institute of New Economic Thinking, quotes a dictum he was once given by a leading west coast economist. "If you got behind Wall Street," he remembers the professor telling him, "you went to Lake Como every summer. If you left finance alone, you took a nice vacation in California. And if you took on the bankers, you drove a secondhand car." Prince Andrew has once more been busy acting as the royal front for UK plc. The Duke of York announced last July that he would step down as the UK's special representative for trade following criticism of his business connections with dictators including Gaddafi. Nevertheless, he has remained at the heart of the UK government's export drive and has carried out 17 engagements in Saudi Arabia and China for UK Trade and Investment, an arm of the Department for Business, Innovation and Skills. In the past six months, he had meetings with 15 ministers from foreign governments in Qatar, Hong Kong and Saudi Arabia and took part in five dinners and lunches abroad in aid of British trade. He had meetings with the emir of Qatar, the crown prince of Abu Dhabi, the prime minister of Malaysia and the presidents of Panama and Mongolia. He hosted a reception last week for UK trade delegates at the world economic forum in Davos, Switzerland. Two weeks ago, he attended a reception for the Turkmenistan-UK Trade and Industry Council In December, he met the king of Bahrain after the Bahrain Independent Commission of Inquiry published a report which, according to Human Rights Watch, "found a pattern of serious human rights violations that included the use of excessive force against peaceful protesters, arbitrary arrests and detentions, torture and ill-treatment of detainees". Travel costs for the trips were covered by royal travel grant-in-aid, which is funded by the Department for Transport. A previous charter flight from Farnborough to Jeddah and back on a trade mission to Saudi Arabia was billed to the taxpayer at £28,767. An economy-class ticket is obviously out of the question! As the SPGB have always pointed out it's a total myth that banks create wealth. They make their profits by lending, borrowing or generally manipulating funds between sections of industry and private individuals which stemmed from profits via the wages system throughout the production of goods and services. In the light of the ongoing recession, job losses, public spending and welfare cuts where the real victims are those who create the profits for the capitalists via the wages and profit system, bonuses on the scale awarded to bailed out RBS boss Stephen Hester are clearly immoral and irrational! Yet he like many other well awarded top financial executives are merely the symptom not the cause of an equally immoral and irrational economic system! Consequently such media orchestrated public hysteria that focusses on him and his ilk personally in order to seduce lesser mortals to make simplistic comparisons between their own financial situations or how much the forces earn fighting resource wars is exactly what the capitalist classes desire because it detracts attention away from the real reason why, particularly in a low growth capitalist economy bonuses of this magnitude are awarded. Despite all the erudite explanations from the economic boffins who monopolise the air waves bankers bonuses like MP's expenses have nothing to do with performance but for the capitalist class they serve as a financial and political reward for playing an integral part in supposedly reviving a corroded low growth economic system in the most authentic way which the bulk of the population might accept! Consequently concerns over what Mr Hester does with his bonus or whether the likes of Sir Fred Goodwin is stripped of his knighthood (which unfortunately seems to be the current Labour Opposition's sole contribution to challenging the Tories on the economy these days) are utterly futile! Alternative economic and social policies are paramount regardless of how much wrath a top financial executive's bonus provokes and if there's no alternative the bonus culture will become even more excessive as UK capitalism slumps even further! The “socialist" paradise of North Korea appears to be no exception to wealth inequality. The gap between its emerging entrepreneurial class and the rest of the country widening rapidly, experts say. The disparity stems from the North’s economic hardship in the 1990s, when its system virtually collapsed and the country suffered a disastrous famine that killed an estimated hundreds of thousands. The chaos forced citizens to rely on private markets and the regime to allow for grassroots capitalism. Speculators took advantage of the reforms by buying supplies when the economy was in relative health and selling them when demand was greatest. Opportunities for those with money increased as the North’s economy slowly rebounded despite international sanctions. The wealthiest and best connected made their money through companies that worked under the guise of being state-run, mostly through joint projects with Chinese companies or in areas such as mining and transportation. Lower-level entrepreneurs have succeeded by trading in private markets goods that come through the porous border with China. Further entrenching the elite class is the pervasive practice of nepotism. Defectors say that high-ranking officials pull strings to place their children in jobs handling diplomatic and trade relations, areas where they position themselves to earn foreign cash and lead stable lives. An Chan-il, a political scientist who defected from the North, says ordinary people are aware of the inequality but lack the political tools to speak out. But experts say the development is concentrated in the capital and a handful of other urban areas, namely Sinuiju, Nampo, Sariwon and Kaesong while the rest of the country faces a starkly different story. An Arizona state Law bans ethnic studies classes and facing a multimillion-dollar penalty in state funds, the governing board of Tucson’s largest school district officially ended its 13-year-old program. Arizona has passed a Anti-Immigration Law, which aims to identify, prosecute and deport illegal immigrants. By attempting to shut down Mexican-American and ethnic-focused programs they, perhaps, hope that racial, ethnic and political issues will magically go away. To justify bigoted laws, they have claimed, in a very devious way, that ethnic and racial oriented classes can only foster division among the pupils and in society in general. These same laws are nothing but mechanisms to legalise racist and discriminatory policies. Evidently the state of Arizona and the TUSD to notice that almost 60 per cent of those under the authority of the TUSD have Mexican-American backgrounds. They have also failed to see that even the name of their state, Arizona, is in itself a Spanish variation of the Aztec word Arizuma, meaning "silver-bearing". Tampering with history, the way that Arizonan legislators and teaching authorities have just done, is nothing new. Only a few weeks ago, the government of Sebastian Pinera of Chile decided to change the term used to describe Augusto Pinochet's regime in all primary school textbooks. What until then had been defined in the classrooms across the nation as a "dictatorship", was renamed in more neutral terms as a "military regime" - where 2,095 people were assassinated, and more than 1,100 were "disappeared" and never found. In both Arizona and Chile the authorities have chosen the path of repressing historical memory in order to reinforce social control. There is thieving and then there is thieving! The media have been saying that Antony Worrall Thompson's repeat thefts are down to abuse in childhood. Whether or not this is true, the punishment handed out to Thompson is starkly different to that meted out to 23-year-old Nicolas Robinson back in August 2011. While Thompson got a police caution, Robinson was sentenced to six months in jail. Nicolas Robinson had entered an already-burgled Lidl during the London riots and taken some bottled water worth even less than the wine and cheese that Thompson had swiped. Despite not having any previous convictions, and merely having momentarily gotten "caught up in the moment", the judge handed out a prison sentence, while Thompson got a slap on the wrist. Quite simply, while Antony Worrall Thompson's petty thieving had no effect on capitalists and those in charge of the political management of their economy, the 2011 riots most certainly did, and put the wind up politicians and billionaires. When lots of people take to the streets and rebel against the system, the authorities and wealthy get panicky. 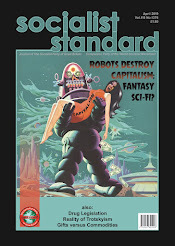 The prime function of a government is to look after the capitalist ruling class and the economy, and if people are helping themselves to whatever they want from shops without buying it, then this will always result in a determination to crack down hard, and do whatever it takes to re-establish and maintain the status quo. Nicolas Robinson was sent to prison in order to send a message to anyone else who might consider challenging the long-standing capitalist regulation of distributing goods and services — don't pay, don't get. Childhood abuse may well lie behind Antony Worrall Thompson's out-of-character behaviour, but capitalism's abuse can also explain Nicolas Robinson's out-of-character behaviour. After spending an entire lifetime being groomed and compelled to purchase everything that's needed, finding himself in front of an already-looted Lidl supermarket, Nicolas Robinson was suddenly faced with a completely strange and bizarre situation. An 'open' shop that he could enter, take something, and leave without paying. The only thing that made his behaviour wrong and illegal was the type of economy that the electorate have been duped into voting for. One where production and distribution are strictly conducted for profit. The fact is, if we had a genuinely socialist economy rather than a capitalist one, then going into shops, taken whatever you need, and leaving without paying a penny would be entirely normal and legal. A society that directly and collectively owned the means of production and distribution (farmland, factories, power stations, railways, HGVs etc) would also collectively own everything that is produced, making money entirely obsolete. With moneyless real socialism, people will obviously still have to work, but it will then be carried out purely in order to provide the goods and services that society needs, and Antony Worrall Thompson, Nicolas Robinson and everyone else can enjoy free-access shopping without any fear of being arrested or punished. An American born into poverty is increasingly unlikely to be able to move up and out. The American Dream while did happen to a few famous individuals like Andrew Carnegie, the scenario was actually unlikely. A number of historical studies have shown that the ranks of the upper middle class to rich -- those who benefitted from the booming economy of the Gilded Age -- were drawn from members of their own class, and their own ethnic group. The odds on a worker or farmer or an immigrant breaking in were slim indeed. America is not the land of opportunity for most folk. Most peoples' destinies are determined by birth. Many children's fates are set before they even start school. A Stanford University study last year shed light on what is sometimes call the achievement gap. The authors say, "the income achievement gap is large when children enter kindergarten and does not appear to grow (or narrow) appreciably as children progress through school." About one third of New York City residents nearing retirement age won’t be able to quit or will have to rely entirely on Social Security because they have less than $10,000 in savings. It’s going to mean a generation of retirees will do worse than their parents and grandparents. They face downward mobility. Romney, the presidential candidate, was raised in privilege - his father was an automobile executive who resigned his CEO position to run for governor of Michigan. The Mitt Romney's of the capitalist world can bring in $20 million a year by not having a job and doing nothing. Yesterday was India's Republic day and we should not forget the 44 per cent of children less than five years old who are underweight nor overlook that 65 children die each day of malnutrition. In all, 21 per cent of all Indians are undernourished. The World Bank says that 42 per cent of India’s 1.21 billion people live on less than $1.25 a day while India’s 100 richest people own assets equivalent to a quarter of gross domestic product. Instead in capitalist time honoured ways, the celebratory parade show-cased India's military muscle. The Indian 2011 defence budget was US$36.03 billion. In 2010, India was the world's leading arms importer accounting for 9% of global imports. By 2015 India will spend an estimated $80 billion on military modernization programmes. The country is planning to spend almost $45bn over the next 20 years on acquiring 103 new warships. So-called public food distribution systems (PDS) have operated for years in dozens of countries around the globe. Governments buy up grains from farmers at a guaranteed price, maintain national grain stocks, and distribute grains and other foods through their PDS to consumers at subsidised prices. India's PDS has been selling subsidised food through "fair price shops" on a national basis since the 1970s. The government in Delhi provides grain stocks to the states, who, in turn, supply the networks of fair price shops. The Food Security Act would increase the amount of grain going through the system by more than 75 per cent. That would raise the total to 66 million tonnes, or more than one third of India's entire grain production. If it were loaded into rail cars, it would occupy a train more than 5000 miles long that would stretch from Delhi to Casablanca. Under the act, a family living below a specified low-income threshold would receive a new food-ration card, allowing each family member seven kilograms of grain each month at ultra-cheap prices: three rupees (about six US cents) per kilogram for rice, two rupees for wheat and just one rupee for sorghum and millet. That programme would serve 46 per cent of the population of rural India and eight per cent of urban residents. Another 27 per cent of Indian households, ones with somewhat higher incomes, would be eligible for three kilograms of grain each month at a higher, but still subsidised, price. Those who would integrate the PDS more fully into the global marketplace seem to be missing the irony of the current situation, in which rural India's increasing exposure to the global market helped make expansion of the PDS necessary in the first place. Today, most people poor enough to be eligible for food rations live in rural areas where people once grew what they ate. Where diverse food crops once covered the landscape, there are now vast monocultures of cotton, wheat, rice, maize and other crops to be sold for cash - and often not enough cash to pay the debt amassed to grow them. The PDS, originally aimed at cities as a subsidy to manufacturers (to keep the workforce fed on cheap food and allow wages to stay low), is now a lifeline for landless workers in the faltering farm economy, who sow and harvest crops they don't eat, only to then consume low-quality wheat and rice that's been trucked into the village fair-price shop from far away. It is estimated that 250,000 debt-ridden farmers have killed themselves beteen 1995 and 2010 . There are 10 million street children , 50,000 in the streets of Delhi alone, who receive no schooling and have no home. 80-100 million children are trapped in endless cycle of exploitation. Moreover, India has the dubious distinction of having the largest number of child workers in the world. More than half of the retail workers surveyed in a study last fall earn less than $10 an hour. Almost one in five earns less than $8 an hour, and almost 12 percent earn minimum wage. About 34 percent rely on public assistance. About one-third of the workers surveyed support a family member on their wages, but the median wage for the surveyed workers is only $9.50 an hour. Over 70 percent don’t receive health insurance from their job. About 25 percent live without health insurance, and 34 percent rely on government programs. Less than half received paid time off or paid sick days. Only 25 percent have ever used a paid sick day. Although Women make up the majority of the retail workforce, the women surveyed are less likely than men to receive health coverage and paid time off, or to be offered a promotion. Just over half (54 percent) of white workers received a raise and promotion after working at least six months on the job, but only 39 percent of African American workers, and 28 percent of Latino workers received raises and promotions. An overwhelming majority (77 percent) of Latina workers surveyed made under $10 an hour. Over 70 percent completed some college or a college degree, with 37 percent some college, and over a third has an associate, bachelor’s or master’s degree. The median wage for those with a bachelor’s degree is only $11.50 an hour. Just over 41 percent were hired as full time, and 53 percent were hired as part-time, with the remaining six percent hired as full-time flex, holiday or temporary workers. Only 17 percent have a regular schedule, and 70 percent only know their schedules within a week. Almost half said their manager changes their shift without their consent. Over a third reported that they sometimes work over 10 hours a day, but only 41 percent get paid an extra hour as mandated by New York State law. The majority (73 percent) reported that if they are sent home before working a full four hours, they are never paid for the full four hour shift, as New York state law mandates. Less than five percent of retail workers are unionized. The study recommends protecting the right of workers to organize. Serious cracks have already appeared, UK politicians are concerned, and a considerable amount of money must be thrown at the problem in order to shore it up and prevent it collapsing completely. No, not capitalism. The Houses of Parliament. On 23 January, MPs on the House of Commons Commission, responsible for the upkeep of the Parliamentary estate, discussed a surveyor's report about the Palace of Westminster’s subsidence. 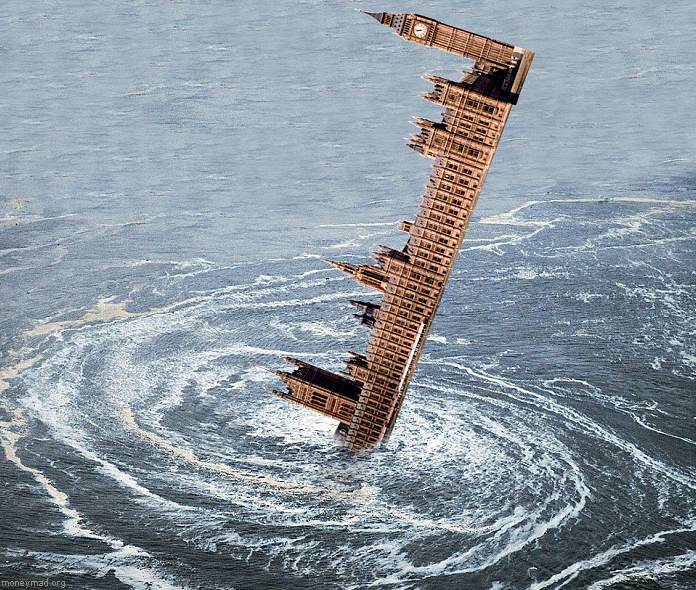 The buildings are slowly descending below the Thames and the Clock Tower is leaning 18 inches off the vertical. It could cost at least £1billion to stabilise. No one can be blamed for suspicions of funny business when Speaker of the House of Commons, John Bercow, suggested selling off the entire edifice to someone very wealthy, seeing how he avoided paying thousands of pounds in capital gains tax on the sale of two properties by declaring them as his main residence to the taxman, yet declared them as second homes for the purposes of expenses. Anyway, two questions come to mind. First, who in their right mind would spend the estimated worth of the parliamentary complex (£500million) when they'd also then have to spend another billion pounds shoring it up? Secondly, why didn't its supposedly intelligent occupants take the precaution in the past of obtaining building insurance cover to avoid the present massive billion-pound repair bill? Even if Westminster Palace was considered 'high risk' by insurers, there are still specialist providers that could have handled it. If they can't even look after the premises in which they make decisions, is it any wonder they're collectively unable to manage the economy? More importantly. Though the Houses of Parliament are subsiding, they certainly can't sink any lower than those within it, since the way parliament operates is acutely undemocratic. The UK population is permitted to choose between candidates of different political parties to supposedly "represent" them, but the system is rigged so that only mainstream capitalist parties get millions in state funds ("Short Money") and millions more in so-called private 'donations' (bungs) from millionaires and billionaires, or in the case of Labour, millions from trade unions (62 per cent of all Labour funding came from unions in 2010). 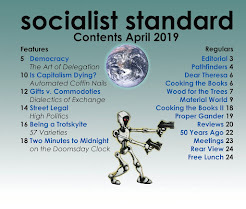 The broadcast and print media also play a role in maintaining the capitalist status quo by devoting 99.99 per cent of their political content to what Tories, Labour and Liberal Democrats are saying. They will excuse this bias on the basis that Tories, Labour and Liberal Democrats got the most votes at the last election, but this excuse conveniently ensures that in the run up to the next election, the electorate will hear nothing from the media about the anti-capitalist alternative, and so help perpetuate an endless game of musical chairs where Tweedledum and Tweedledee leaders take turns to govern for 5 years. Worst of all, the "representation" that any pro-capitalist government claims to be performing on behalf of the electorate as a whole is a contemptible lie, since those elected to manage capitalism are compelled to operate within parameters set by the economic system for which they stand. Based upon minority ownership of the means of living, capitalism can only ever operate in the interests of that asset-owning capitalist minority — not the electorate as a whole. Theirs is a system driven by profit which severely restricts what can be achieved. And with outdated capitalism and the economy on the slide, it is frequently a case for those in so-called 'power' now of what must be undone, rather than done. Consequently, as long as the working class keep delegating to the capitalist class the right to govern, by empowering lookalike puppet politicians, they perpetuate their own exploitation. A genuine democracy would be a participatory one, where all are involved in decision making that shapes their lives, and decisions made can actually be accomplished through having social collective ownership of the means of production and distribution. A participatory democracy would not mean everyone having to take part in numerous daily votes on numerous matters. Communities can select socialist delegates who act on their behalf. Within a genuine classless socialist society, such appointees would be equals — not leaders. They would not be constrained by any financial factors as primitive money would then be obsolete. All work and the provision of goods and services would be on the basis of "from each according to his ability, to each according to his need". These socialist delegates would be genuinely capable of benefiting those they act for — not like today's pro-capitalist MPs, who frequently give a sham promise to do their best, while knowing full well that the economic realities of capitalism mean there's nothing they can do. Post capitalism, socialist delegates could even make use of Westminster Palace for their debates, although given its deplorable history, I'm really not sure they'd want to. "...the bottom line is this: A highly complex set of laws and exemptions from laws and taxes has been put in place by those in the uppermost reaches of the U.S. financial system. It allows them to protect and increase their wealth and significantly affect the U.S. political and legislative processes. They have real power and real wealth. Ordinary citizens in the bottom 99.9% are largely not aware of these systems, do not understand how they work, are unlikely to participate in them, and have little likelihood of entering the top 0.5%, much less the top 0.1%. Moreover, those at the very top have no incentive whatsoever for revealing or changing the rules..."
"The transcripts of the 2006 meetings, released after a standard five-year delay, clearly show some of the nation’s pre-eminent economic minds did not fully understand the basic mechanics of the economy that they were charged with shepherding. The problem was not a lack of information; it was a lack of comprehension..."
Burns's funeral attended by 10,000 was conducted in a military ceremony. The Dumfries Volunteers acted as the pall bearers. His uniform, hat and sword crowned the coffin, the Cinque Port Cavalry band played Handel's Dead March from Saul and the Angusshire Fencibles fired three volleys over his grave. He was the 18th century Bob Dylan and John Lennon rolled into one some say. The reign of Peace and Libertie! We have a right to try it. Shall don the Cap of Liberty! The reign of Peace and Liberty! 'The Twa Dogs' is a dialogue between an 'upper-class dog' and an 'under-dog' and Burns contrasts the imaginary suffering of the wealthy with the real hardship of the poor. The warld would live in peace, man. The din o' war wad cease, man. Sic halesome, dainty cheer, man! To taste the fruit o't here, man! That gives us liberty, man. Burns - 12 children in all by 4 different women - a womanizer and libertine or supporter of womens liberation? The title of the poem, "The Rights of Woman" immediately calls to mind Thomas Paine’s The Rights of Man. "Ca Ira" ("It Will Come") was the song of the French Revolution. 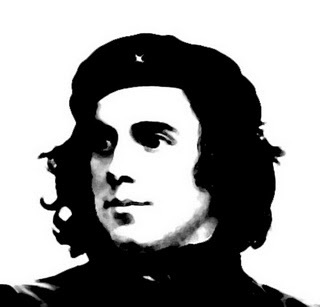 "Though I am not Scots and have a coloured skin I am proud to be among you, and that I learned from Robert Burns - 'A man's a man for a' that, then let us pray that come it may, as come it will for a' that, that man to man the world o'er shall brithers be for a' that.' "
It’s the US presidential election year. The media circus is in full flow and the season is a long one. It appears the aim is to keep the public’s eyes as far away from reality and the real issues as possible. There are issues that should be engaging the media circus, placing them squarely in front of the electorate and the presidential candidates. But they aren’t and they won’t be because the mass media supports the status quo. As Barack Obama prepares for his State of the Union address it is good that so many of Obama’s followers are disillusioned. However it seems, though, that many of those who describe themselves as disillusioned are accusing Obama of breaking his promises, rather than blaming themselves for falling victim to a naïve illusion. The idea that Obama has broken his promises can only seem valid to those who – against all the evidence he himself provided – fashioned an image of him as the country’s progressive saviour. Obama made no secret during his election campaign of his “moderate” political outlook. A central theme of his campaign, in fact, was the need for bi-partisanism to counter the trend towards politics becoming too “ideological”. Those who now criticise Obama for being yet another spineless Democrat were not paying adequate attention to the statements he made during the campaign. Obama made no secret of his deeply-held principle of never sticking to any principle. He has never claimed to be anything but a “pragmatist”, which is a nicer way of saying “opportunist”. Obama has not budged from his belief that the solutions to the problems plaguing the United States can be found lying in the middle of the political road, so to speak, just waiting to be picked up. This is the belief he wrote about back in 2006, and his policies in office have been based on it. A mistake that voters often make, especially during election campaigns, is to compare what the Republicans say and do with what the Democrats say. The relevant comparison is with what the Democrats do. The trouble is that when the Democrats have been out of office for a few years most voters no longer remember what they do. Those familiar with Obama’s record as a congressman, might have noticed that between what the Democrats say and what they do yawns a chasm wider than the Grand Canyon. In stump speeches in the mid-West, candidate Obama thundered against regional companies such as Maytag and Exelon. And yet these same companies, justifiably confident that he would do nothing to harm their interests, made large financial contributions to his campaign. Speaking before audiences of workers, Obama would denounce Maytag’s decision in 2004 to close the refrigerator plant in Galesburg, Illinois, entailing the loss of 1,600 jobs to Mexico. But he never raised the issue with Maytag directors Henry and Lester Crown, even though he enjoyed a “special relationship” with them. How many people must have voted for Obama in horrified response to the exultant cry of John McCain and Sarah Palin: “Drill, baby, drill!” But in March 2010 Obama broke his campaign pledge and gave the go-ahead to offshore operations. The next month we had the BP Bluewater Horizen oil-rig explode in the Gulf of Mexico and spew out its oil. Obama's drive to the Presidency, from promises so vague as to almost defy analysis, from its inception through its planning to its execution was known for its single-minded cynicism. He and his team touted for votes on the single word "Change". Things have indeed changed – just not for the better. He left many Bush Administration policies intact; and even his healthcare reform that leaves the parasitic insurance companies in place and even presents them with opportunities for expansion. Obama conveys the impression that they are finally going to make proper healthcare available to everyone. But this turns out to mean only that everyone will have access to health insurance. You will still have to pay for it. Obama-care will make the health insurance companies introduce a wider variety of more affordable schemes. That may reduce the number of uninsured somewhat. But cheaper schemes are schemes with poorer coverage and/or higher co-pays and deductibles. (A co-pay is the part of a charge for services that is paid by the patient, not the insurance company. A deductible is the amount that the patient has to pay before the insurance company starts to make any contribution at all.) And still some people won’t be able to afford even the cheapest schemes on offer. “I believe in the free market, competition, and entrepreneurship, and think no small number of government programs don’t work as advertised…I think America has more often been a force for good than for ill in the world; I carry few illusions about our enemies, and revere the courage and competence of our military…"
Yet how can Obama be blamed for all those false expectations? The signs that Obama was more of a wolf in sheep’s clothing were there for all to see. Obama, for all his oozing liberal rhetoric and strong likeability factor, while an Illinois Democratic senator had always supported a free market system. His views on foreign policy, for example, an area where the views of the “anti-war” candidate Obama were thought to differ sharply from the hawkish approach of Hillary Clinton (now his Secretary of State! ), not to mention the belligerent policies of Bush and McCain. Obama made it perfectly clear in The Audacity of Hope that he would deploy US troops when necessary, because “like it or not, if we want to make American more secure, we are going to have to help make the world more secure”. Rather than rejecting Bush’s absurd and counter-productive “war on terrorism”, Obama wrote that “the challenge will involve putting boots on the ground in ungoverned hostile regions where terrorists thrive”. And lest the reader imagine that such military force would only be used in retaliation, Obama claims that “we have the right to take unilateral military action to eliminate an imminent threat to our security”. It is something of a mystery how Obama managed to convince so many that he was a foreign policy “dove” while at the same time publishing such views. It did not take long for the true Obama style of government, behind the media drivel, to assert itself. Only days after he had taken office, two American drone craft killed 22 people in Pakistan and it was announced that Obama had approved the transfer of 30,000 US troops to Afghanistan – later raised to 60,000. Tied down in the unpopular Afghan war, with his domestic woes rising and his political standing falling, Obama was desperate for a military success story, and hey presto, the killing of Osama Bin Laden served as a much needed propaganda tool to enhance the standing of the US military and, of course, himself in the eyes of the public. It and the continued use of drone attacks flies in the face of Obama’s Nobel Peace Prize, awarded to him for ‘his extraordinary efforts to strengthen international diplomacy and cooperation between peoples’. Obama has delivered speeches around the world extolling the virtues of his policy of respect and tolerance for others. The contrast between words and deeds is plain to see for those who will take the trouble to look beyond the rhetoric. “Fine words butter no parsnips!” as they say. As the front-man of Corporate America, and in recognition of how thinly stretched its forces are, Obama is presently speaking of friendship, trust, respect, tolerance and cooperation whilst at the same time clearly wielding the big stick of consequences should anyone fail to recognise or respect the US's manifest Divine Destiny. 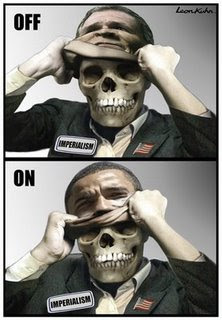 US foreign policy is not about furthering US interests to benefit its citizens it is about furthering US corporate interests to benefit its elite – very different from its publicly stated objective. To say that Obama came to “power” in the US is a misnomer, power is bedded within the “Corporate State” yet his electoral propaganda of “Change we can believe in”, his apparent charm and chalk and cheese difference from Bush has millions around the world believing that the universe is a better place for his being elected – it is no different. Despite the world economic crisis capitalism is not weakened, it can still fund its institutions and fulfil the fantasies of the elite, it can still fund its imperialist wars and it can still fund its formidable forces. Obama called his book Audacity of Hope. We also dare to hope but our hope lies not in some charismatic, middle-of-the-road corporate state politician. Our hope lies in the set of principles that defines socialism and guides our vision of a future world. Our hope lies in our belief in basic human decency and our shared humanity. Change will come when enough people decide that enough is enough and when enough people have done enough of the right things. To bring real and lasting change for the benefit of all, the world needs socialism. Is that too audacious to hope for? In regards to climate change and American policy, nothing there changed with Obama. He still bats for US capitalist industry, arguing for the continued use of coal and oil. US State envoy Todd Stern said that Obama had no plans to sign up to Kyoto, except possibly for offsets and a market-based trading system, ‘We're not going to do Kyoto, and we're not going to do something that's Kyoto with another name.’ The US gives no assurances but a bill Obama has said he supports (the Waxman-Markey bill) would give less than 5 percent CO2 reductions by 2020. Few of his thoughts are in harmony with the views of his left-wing supporters, who worked so hard to get him elected. People went from the naïve view that Bush is the root of all evil to the equally simplistic idea that Obama could uproot that evil. And now we have a sense of disillusionment due to the persistence of deep-rooted problems despite the election of Obama. Yet the idea that Obama has betrayed us is based on the initial illusion that he could rescue us from problems that are deeply rooted in capitalism itself. This notion, in turn, is no different from the superficial idea that those problems arose from Bush’s stupidity or mendacity. For the sake of argument, let us suppose that the Democrats are a significantly lesser evil. In that case, helping them into office does ward off a greater evil. But only in the short term. For once in office, Democrats come under irresistible pressure from their capitalist masters to break their “populist” promises, to disappoint, disillusion and betray the working people who placed their trust and hope in them. Some sink back into apathy and despair, while others fall prey to a racist or fascist backlash. These reactions give the Republicans their chance to return. This is a recognizable political cycle. We have been through it before. Over and over again. Those who support the lesser evil play an essential role in constantly reproducing the cycle. They share the responsibility for its persistence. Support for the lesser evil entails support – indirect and delayed, but support nonetheless – for the greater evil. From this perspective, the differences between “greater” and “lesser” evils do not matter. Some capitalist politicians are totally subservient to the oil, gas, and coal corporations and recklessly oblivious to the looming danger. In their hands we are doomed. Other capitalist politicians are a little less subservient, show a limited awareness of the situation, and try to do something to mitigate it. Something, but much less than is absolutely essential. In their hands we are still doomed. "If Obama apologists think President Obama will put a halt to the blood letting they are going to be sorely disappointed. Make no mistake; whilst the left are fond of castigating Republicans as the masters of war, the truth is that historically the Democrats have started far more wars than the GOP. More recently, under the last Democrat to hold office, President Clinton, one million Iraqis are said to have died under US enforced sanctions, 500, 000 of them children. Sorties over Iraq were flown every single day Clinton was in power. Yugoslavia was mercilessly bombed and a much needed pharmaceutical plant in Sudan was bombed on the pretext that it was manufacturing Chemical weapons, and villages in Afghanistan were flattened because Bin-Laden was presumed to be living there. And who could forget the US invasion of Somalia, with troops storming the beaches live on prime time TV!...Not only is Obama incapable of ushering in significant change, bar a few miserly reforms, but neither is there anyone he can bring to his administration capable of bringing the change that was so promised in his election campaign for no other reason that changers do not get confirmed by the Senate. There exist quite influential interest groups – the AIPAC, the military security complex, Wall Street etc to hinder the advancement of such undesirables The hope many have in Obama to implement policies that will benefit the class that matters is misplaced. His political rawness means he will be manipulated by more experienced advisers, little different from the neo-cons, maybe even key figures from the Bush administration, and pressured by a corporate elite who funded his victory to execute policies that fit in with their own agenda. The outcome of US elections carries one truth: namely that whichever candidate becomes president, he has but one remit once in office – to further the interests of the US corporate elite.It’s just not a feasible option for any newly elected president to entertain any idea other than guaranteeing a safe playing field for the domestic profit machine and doing what’s needed to try to ensure the US maintains its global hegemonic status "
Despite evident disillusionment with Obama by the likes of Michael Moore, he and other urges people to work for change through the Democratic Party – a recipe for endless failure and frustration. While protesting that we are not being rewarded sufficiently in forging our chains, we then cooperate in putting the shackles to our own ankles by voting for latest slick marketing ploy coming from the mouth of the newest political product of Corporate State Inc. There has been no change! Reports in the press say that the wealthy paid “wads of cash” to get on the lifeboats as the Costa Concordia cruise ship was going down. A resident of Giglio, where the lifeboats made shore after the disaster, told German media: “I went to the boats as I saw them coming in expecting to see women, children and the injured but all I saw were healthy men and elegant women in evening gowns..."
The claims may well be exaggerated. Yet they’re likely to recall one of the enduring narratives of the Titanic. When the Titanic sank there were widespread claims that the rich got the lifeboats while the non-rich were left to drown. When the Titanic sank, rich and poor alike died but the ratios were still skewed in favor of the wealthy. In first class over a third of the men, almost all of the women and all the children survived. In second class, it was less than 10 per cent of the men, 84 per cent of the women and all the children. In steerage 12 per cent of the men, 55 per cent of the women and less than one in three of the children survived. In today’s times, the idea of the wealthy buying their way to safety at the expense of others clearly has resonance, echoing the view that in the current recession the rich were bailed out while the rest of American sank. Technological advancements have minimized the need for employees to be as physically present in a traditional office setting, and employee relationships now extend across different time zones and geographies. From the four walls of an office to the online world; the emergence of new flexible hours that no longer require a nine-to-five clock-in. We now have the concept of the throwaway worker - temporary contract workers - freelancers. Work is farmed out on a piecemeal, on a as-needed basis (often for relatively little money). Where once families lived paycheque to paycheque, they now face the prospect of trying to live job to job. Today, as many as one in eight Canadians hold temporary jobs. A study last year by Statistics Canada showed that temporary employment, which also includes seasonal and casual work, grew rapidly between 1997 and 2005 from 11.3 per cent of all paid jobs to 13.2 per cent, generally exceeding the growth of permanent employment. But the real story was in contract positions, which continued to increase even as overall temporary hiring slowed in 2006 and the recession hit a few years later. By 2009, they comprised 52 per cent of all temporary positions in Canada. More than one-quarter of them are professionals. A survey of 2,000 U.S. companies by the consulting firm McKinsey & Co. found that 65 per cent of U.S. corporations made operational changes to improve productivity and reduce employment in the past three years. And nearly half of them said they planned to use more part-time, temporary and contingent workers going forward. There are other implications. Lewchuk co-authored a recent study of 3,000 Canadians that concluded that, over a long period, the stress associated with a precarious employment status can become a health hazard to workers and their families. “I think people have shorter lives because of it,” he says. The health of babies born in deprived areas could be damaged for the rest of their lives long before they have even left the womb, according to research. They have found stressful conditions experienced by expectant mothers in impoverished areas because of poor lifestyle choices could impact on their children’s DNA – leaving them with an increased chance of developing diabetes and cardiovascular disease later in life. Genes were found to be affected within the first few weeks of an embryo’s development – meaning some mothers in deprived postcodes could be putting their children at harm without knowing they are pregnant. Experts in epigenetics – which explores how someone’s environment and lifestyle choices can influence their genetic code, and that of their children. They believe factors experienced by expectant mothers in areas of deprivation cause “bugs” to develop in the DNA of embryos, with the children more susceptible to early onset of diseases when they become adults. The researchers found significant differences in levels of “methylation” in the DNA of people from different ends of the socio-economic spectrum. DNA methylation is a natural biochemical process which controls how genes work. The majority of this methylation content is fixed for life in humans from just a few weeks after conception as the structure of the body and organs is formed. Enzymes in the body create chemical “tags” which are imprinted on to DNA to switch on or off genes at the right time and in the right place. Most of these tags stay in place for the rest of an individual’s life. The tags are “read” by cells, similar to the way software’s binary code is processed by computers, and ensure each cell switches on or off only the genes it is supposed to in order to ensure the body works correctly and remains healthy. However, lower levels of methylation can impair this process, increasing the chances of developing diabetes and cardiovascular disease later in life. Charities campaigning to tackle child poverty described the research as “startling evidence” of the impact poverty can have on children before they have even left the womb. Professor Carol Tannahill, director of the Glasgow Centre for Population Health, which funded the research as part of an ongoing public health study known as pSoBid, said: “The association between deprivation and ill-health is well established, but the pathways through which deprivation leads to poorer health outcomes are less well understood. Previous findings from the study have confirmed that people with relatively low income, living in poor circumstances, have more miles on their biological clock than people of the same age in better circumstances. The new findings add evidence that people in poorer socio-economic circumstances may face an uphill health challenge from before birth. Health inequalities are a reflection of wider inequalities in society. We are now learning that these inequalities have direct epigenetic effects..."
The charity Age UK found in a survey that one in two pensioners, hit with fuel poverty, is not warm enough because he is trying to make savings. In other words, Half of British pensioners have been forced to give up their homes' warmth to save money. The charity also found that some two million elderly people are so poor that they go to bed earlier at nights in an attempt to get warm without higher energy bills. Since 1980 the top 1 percent has increased its share of the national income by an astounding $1.1 trillion. Today 300,000 very rich Americans enjoy almost as much income as 150 million. Since 1980, the income of the bottom 90 percent of Americans has increased a meager $303 or 1 percent. The top 1 percent's income has more than doubled, increasing by about $500,000. And the really, really rich, the top 10th of 1 percent, made out, dare we say it, like bandits, quadrupling their income to $22 million. Meanwhile a full-time worker's wage was 11 percent lower in 2004 than in 1973, adjusting for inflation even though their productivity increased by 78 percent. Productivity gains swelled corporate profits, which reached an all time high in 2010. And that in turn fueled an unprecedented inequality within the workplace itself. In 2010, according to the Institute for Policy Studies, the average CEO in large companies earned 325 times more than the average worker. Many argue that inequality doesn't matter because in America ambition and hard work can make a pauper a millionaire - it is called the American Dream. This is folklore. A worker's initial position in the income distribution is highly predictive of how much he or she earns later in the career. And as the Brookings Institution reports "there is growing evidence of less intergenerational economic mobility in the United States than in many other rich industrialised countries." The bitter fact is that it is harder for a poor person in America to become rich than in virtually any other industrialised country. Loggers in Brazil captured an eight-year-old girl from one of the Amazon's last uncontacted tribes and burned her alive as part of a campaign to force the indigenous population from its land. Thinktank says rich will prosper but ordinary families will not regain pre-recession earning power for eight years. The study, which focuses on the state of the "squeezed middle" and is produced by the independent Resolution Foundation, looks at the situation of 10 million adults, who crucially do not rely heavily on means-tested support from the state, and their 5.2 million children. Researchers show that if growth remained sluggish for the next eight years the average annual disposable income of people "middle income" , representing a third of the population, would be £20,200 in 2020 – around £1,700 less than in 2007. he real winners would be the top half of the country's earners, whose real disposable income would rise by almost 10% by 2020. Even under the slow growth scenario envisaged by the foundation, the top half of society would see incomes rise by 4%. The report says the squeezed middle has to cope with a prolonged wage squeeze – with real wages falling 4.2% over the last year – and warns that the most significant cuts to tax credits have yet to kick in. It says that the major recipients of tax credits are facing a further loss of income. The report's author, Matthew Whittaker, said there was a "growing inequality of earnings" at the heart of the long-term squeeze. Gains flowed primarily to higher income households and, more particularly, to those at the very top of the distribution. "If this trend continues once growth returns it may not be just those on low and middle incomes finding themselves left behind in the next decade, but rather the majority of society." In his latest book “Mass Destruction – the Geopolitics of Hunger”, Jean Ziegler, ex-UN Special Rapporteur on the Right to Food and now Member of the UN Human Rights Council's Advisory Committee, talks about the current state of the world and the politics of starvation of the poor, which has led to a crisis situation amounting to calculated murder. What we are witnessing today is the worst hunger crisis in human history is. This crisis is not determined by fate but because of a colossal mis-management for profit. The world could perfectly well provide food for 12 million people, almost the double of the present population of 7 million. So what made this murderous situation possible where thousands of people are dying (37,000 every day) from lack of food and clean water? It could have be avoided. It should not be happening. “The ideologues of the World Bank are infinitely more dangerous than the sad marketing agents Bolloré, Vilgrain (French investors in Africa) and company. With hundreds of millions of dollars of credits and subsidies, the World Bank funds the theft of arable land in Africa, Asia, Latin America. ...For the United States and its mercenary organizations – the World Trade Organization (WTO), the International Monetary Fund (IMF) and the World Bank – the right to food is an aberration. To them, there are no human rights except civil and political.Behind the WTO, the IMF, the World Bank, the Washington government and its traditional allies, appear of course the huge private transcontinental companies. The increasing control these transcontinental corporations exert on vast sectors of food production and trade have of course significantly affected the exercise of the right to food." Food has to be imported – all for the profit of the big corporations. Poor people can not afford buying imported food at artificially high prices. Children go hungry, pregnant mothers are undernourished and so their babies are born with what can be called birth defects. Very importantly, their brains are insufficiently developed and this deficiency can never be recovered. A large number of the infants die before the age of two. Malnutrition is rampant and it causes unimaginably horrible diseases, such as noma, which is far less known than the killer diseases such as malaria, dysentery, cholera, tuberculosis, diphtheria and other infectious diseases. Noma is not an infectious disease but it has been proven that it is due to severe and chronic malnutrition. "The speculative madness of the predators of the globalized financial capital has cost Western industrial states in 2008-2009, $ 8,900 billion in all. Western states have in particular paid trillions of dollars to bail out delinquent bankers." FAO [the Food and Agriculture Organization] and the World Food Programme (WFP) are two institutions threatened with ruin. The sad fate of those two organizations is that they were both rendered fairly helpless when the current economic crisis took hold of the world. The mandate of the WFP is precisely to eliminate hunger and poverty in the world, but with a severely reduced budget, how are they going to reach their goal? Capitalist solutions are no solution! A Happy Chinese New Year? The organisers of this year's London Olympics said they were investigating claims that cuddly toy versions of the Games mascots are being made by poorly paid workers in a Chinese factory. Golden Bear, based in Telford, central England, has a licence to produce Olympic products based on Wenlock and Mandeville, the official mascots of the Olympics and Paralympics. Allegations are that workers making the mascots were working for more than 11 hours a day for as little as 26 pence (40 US cents) an hour . In China, unions are outlawed and workers who use the officially advertised mechanisms for redressing exploitation can be blacklisted as troublemakers. The Trotskyist website ChinaWorker reports that the first week of 2012 witnessed a fresh wave of strikes across at least six provinces – Sichuan, Hebei, Jiangsu, Liaoning, Guangdong and Guangxi. China’s ‘sweatshop revolt’ is continuing and deepening as bosses’ try to force through wage cuts or relocate factories to cheaper production centres at home and abroad. This could also explain the increasing trend to introduce new technology. An upsurge of workers who are replaced by robots is now a hot topic in the Pearl River Delta region, with Foxconn being one of the most prominent examples. Foxconn has been heavily hit by labor issues over the past few years. To improve productivity and product quality it has declared it will introduce 1 million robots over the next three years to replace many of its workers - that it equals the number of operational robots worldwide. Once the cost of labor exceeds the cost of deploying robots, it is clear what a company will have as its workforce. Robots can work 24 hours a day, need no incentives to stay or payments to social security, but instead provide better output for routine work with higher efficiency and accuracy. Although the upfront investment is significant, established Chinese companies can afford it.Taking the molding industry as an example, the average salary of a worker is 1,500-1,800 yuan ($230-280; 180-220 euros) a month. Adding the cost for food and accommodation, the total cost for a worker is at least 2,000 yuan a month. As a robot can only execute certain tasks, 20 percent of the work remains to be done by a human worker. With the price for robots ranging between 20,000 and 30,000 yuan, the investment can be usually recovered within one to two years. The prices for robots have fallen as a result of technological improvements and the beginning of mass production. Robots have an average life span of 12-15 years, so the economics for a decision in favor of machines can be compelling. Ruth Dearnally, director of “Stop the trafficking” from the UK, addressed human trafficking in athletes and global sports competitions. She said that sportsmen and sportswomen are usually overworked and exploited publicly for the purpose of national pride and winning. “They usually fall as an easy prey for the greed of people and the demand is high on them..."
Unions in the US have hardly grown in more than 30 years. 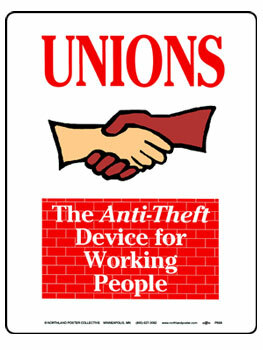 The private sector trade unions enroll but one out of every 14 workers. Meanwhile the strike has practically vanished from the American landscape - there were at least ten times more each year in the 1970s - and the negotiation of a new union contract, in both the public and private sectors, is considered a labor victory if the workers escape without too many givebacks. But the fate of unionism is all about class power in American society and the ideologies that motivate those who either defend or defame these institutions. It is the unions -- in their sometimes plodding and prosaic fashion -- that have long ameliorated the stark disparities of wealth and income that an unfettered capitalism so naturally produces. By the far greater impact on the distribution of American wealth and power is the existence of a union movement and the prospect that it might one day grow again. When they are strong, unions can limit the prerogatives of individual businessmen, government officials and the untamed workings of the labor market. Free-marketeers find all this intolerable, which is why governors like Scott Walker and New Jersey's Chris Christie so often seek to demonize the trade unions as corrupt and omnipotent. Fortunately, that rhetoric has found its limit, first in Ohio and now in Wisconsin where more than a million citizens put down their names endorsing the union idea. In a stunning achievement for trade unionist opponents of the Wisconsin governor Scott Walker marshaled over a million signatures for a petition that has made it possible for Walker to lose his office in a recall election this spring. If so, that would be the first successful gubernatorial recall in Wisconsin history and only the third in that of the United States. Coming on the heels of the November referendum in Ohio, which overturned a similar Republican-sponsored law, it's clear that the American trade union movement is not yet dead. Why on Earth are there so many of us?